1. SMOOTHENS: reconstructs and transforms hair texture instantly. After shampooing, apply 2–3 drops of SP LUXE OIL through the mid-lengths and ends. Hair quality feels instantly improved after just one application. 3. PROTECTS: creates an invisible hair shield. Work a small amount of SP LUXE OIL through damp hair, use a widetoothed comb to gently remove any tangles, and dry hair. 4. DEFINES: provides definition for curls and fine hair. Before drying, apply 2–3 drops to the hair and work outwards to define hair as desired, whether for curls or fine hair. 5. MOISTURIZES: as a pre-shampoo treatment. Divide the hair into sections, and apply 2–3 drops of SP LUXE OIL to the hair and scalp. Massage and leave in for 5–10 minutes. Comb through and then follow with SP Shampoo and Conditioner. 6. SMOOTHES: provides post-blowdry protection. To control dry, frizzy hair, apply a few drops of SP LUXE OIL after blowdrying. Reapply as needed. 7. ILLUMINATES: creates beautiful shine. For ultimate shine, blend 2 drops of SP LUXE OIL and apply to damp hair before styling as usual. 8. RECONDITIONS: treats hair overnight. 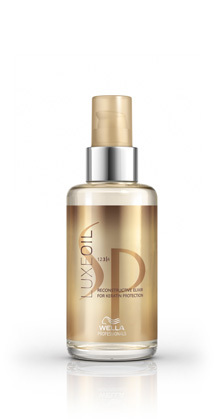 Apply SP LUXE OIL evenly through the hair before going to bed. In the morning, either leave in or rinse out.